Extra light weight with triple-reinforced, riveted handles to really take a pounding.An ideal training tool for any athlete. Work on body shots, target areas, combinations, attack zones and more. 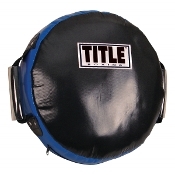 Measures a full 16" in diameter with more than 6" of padding.Color: Black/BlueSize: 16" x 6"